The North Point Lighthouse and Museum is a beautifully restored landmark and museum located between two ravines in picturesque Lake Park on Milwaukee's historic East Side. It is one of the city’s oldest structures and features a 74-foot tower and Queen Anne-style keeper's quarters. Museum exhibits and artifacts tell the history and stories about Milwaukee's lighthouses, the keepers who maintained them, and Great Lakes maritime industry. Built in 1888, the unique octagonal lighthouse guided a bustling maritime trade on the Great Lakes for almost 100 years. When Frederick Law Olmsted, architect of New York City’s iconic Central Park, was commissioned to design Lake Park, he built the grand Lion Bridges to join the north and south sections of the park—placing the North Point Lighthouse in the middle as the park’s crown jewel. North Point Lighthouse is listed on the National Register of Historic Lighthouses and the National Register of Historic Places. Explore and experience this unique Wisconsin historic treasure and museum. • Climb the 1888 74-foot tower for a spectacular 360° view of historic Lake Park, Lake Michigan and Milwaukee. • Discover how the lighthouse was a beacon to the Great Lakes maritime industry for almost 100 years. 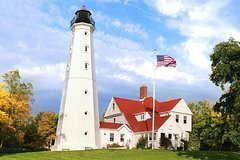 • Enjoy docent-led museum tours about the history of the North Point Lighthouse and its importance to Milwaukee’s shipping industry. • View exhibits featuring keepers tools, log books and personal items, the history of Milwaukee's lighthouses, Milwaukee's immigrant roots and maritime artifacts used by sailors on the Great Lakes. • Learn about the keepers and their families, and how they maintained the lantern room light. Georgia Stebbins, our only woman and longest-serving keeper, climbed the tower nearly 64,000 times while tending to the light! • Explore the maritime history and artifacts about the ships that sailed on Lake Michigan—and the shipwrecks that occurred. • Learn how lighthouse illumination works and see the original Fresnel lens that served as the guiding light for ships entering Milwaukee's harbor. July 4, 9:30 a.m. to 3 p.m. Active military and veterans, and their immediate families, are admitted free from Memorial Day to Labor Day during the summer.